I remember when I was a child, my mom took us on a tour of the Utah State Capitol. I remember looking up on the ceiling of all of the cool paintings and sculptures. I was also fascinated by the statue out front of Massasoit, a native american chief who helped the early settlers. Later on in life, my high school held Jr. Prom at the Capitol Rotunda. After High School, my husband and I attended a Halloween dance in the Capitol Rotunda. 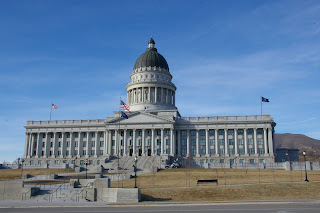 - CLICK HERE for the history of the Utah State Capitol. - CLICK HERE for the history of the White Chapel across the street. They have many rooms and spaces that you can reserve for various activities. You can view the photo policy on the Utah State Capitol website. You can take a VIRTUAL TOUR of the Utah State Capitol by CLICKING HERE. - Guided tours begin inside the east doors of the Capitol on the first floor and last approximately one hour. - Tours are offered on the hour between 9:00AM and 4:00PM, Monday through Friday, with the exception of state holidays. A reservation at least one week in advance is required for groups of 10 or more. - Evening tours may be scheduled on Wednesdays at 5:00, 6:00, and 7:00 by appointment only. - You may also use a self-guided tour brochure, available at the Visitor Service Desk, to explore the Capitol on your own anytime the building is open to the public. - If you are visiting with children, please feel free to download the Capitol Bingo activity here. Groups of 15 or less are invited to complete the activity and stop by the Visitor Services Office during business hours for a special treat! To schedule a group tour of the Utah State Capitol, VISIT THIS SITE, or you can contact them at capitoltours@utah.gov or by phone 801-538-1800.